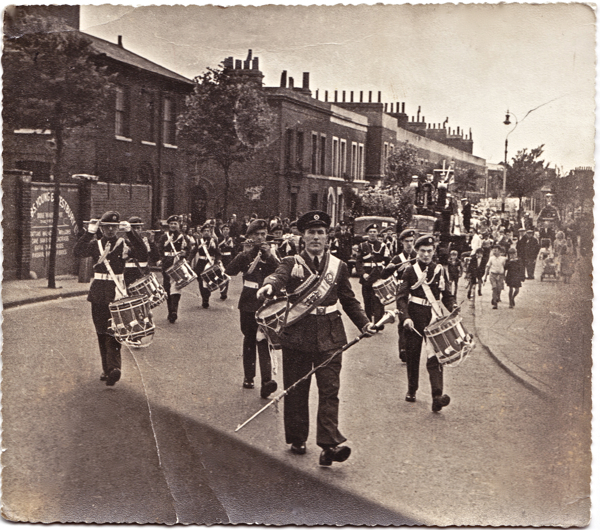 Leading this splendid parade advancing manfully down the Old Ford Rd is Leslie Norris, Warrant Officer of the London District Air Training Corps, at the head of the very first Bethnal Green Carnival in 1952 – and such was the joy that Leslie felt in being at the centre of his community, evident in this heroic image, that it remains undiminished even half a century later. 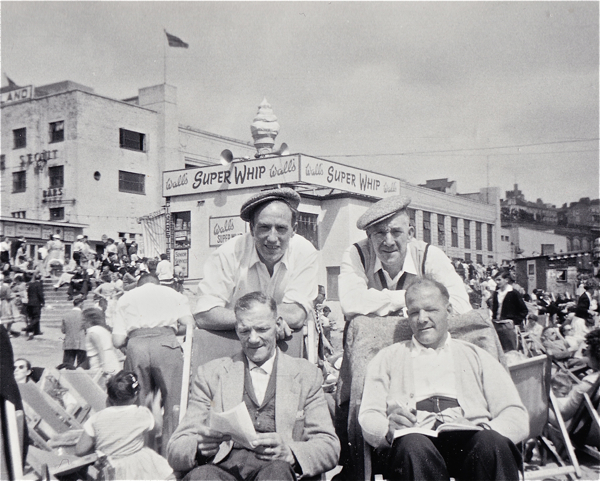 Growing up in the streets around Hackney Rd, Leslie earned the nickname “Ginger” and although now, at eighty-five, only a few fiery-red hairs in his eyebrows remain as clues to its origin, when I visited Leslie in his current home in Essex, he was eager to declare his enduring emotional loyalty to Bethnal Green. “Even though I live in Romford, I am an East Ender,” he confirmed to me absolutely with a proud grin. At first, when Leslie’s father took over his brother’s sawdust business, Leslie helped out by delivering the sawdust to the jewellers in Hatton Garden, but his first real job was as a “glue-boy” in a furniture factory in Columbia Rd. 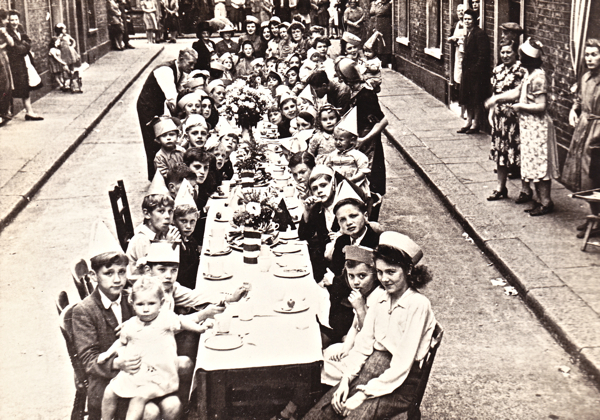 “At the age of fourteen, I once pushed a barrow with an oak dining table and four chairs all the way to St. Anne’s Rd in Tottenham – I know it was 7th September 1940, because afterwards I had to rush home and put on a suit for my brother’s wedding. And then that night, during a raid, three of my cousins were killed.” he recalled in sober contemplation. Next, Leslie went on to work in a saw mill in Ezra St – but the events of September 1940 meant that he had already determined to join up as soon as he was old enough and in 1943, after training, he became a wireless officer in the Royal Corps of Signals, serving in Burma. Back home after the war, Leslie centred his existence around St. Hilda’s East on the Boundary Estate. “It was the place everyone met in those days. We’d go every night. 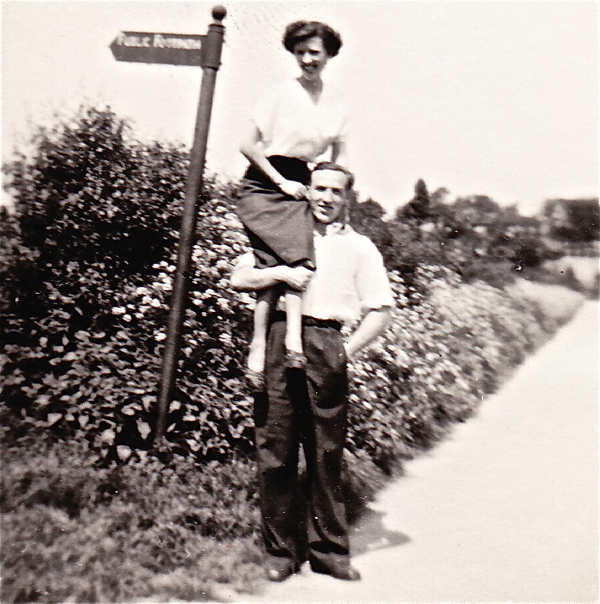 We used to love to dance – even though we only had five records to dance to!” he enthused. 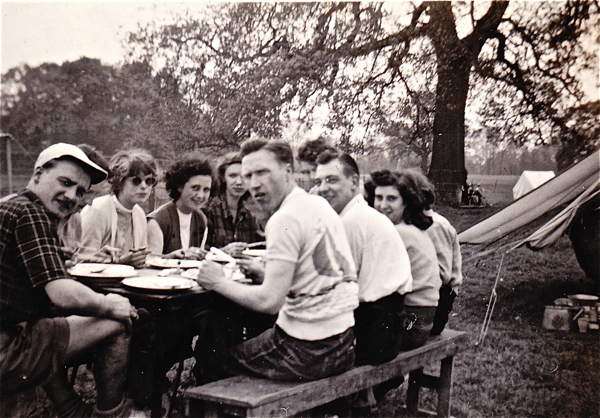 Possessing the charisma of a natural leader, Leslie became both Chair of the Senior Club and Captain of the football team at twenty four, organising camping trips and days out – involving his contemporaries from the immediate neighbourhood who all became life-long friends. 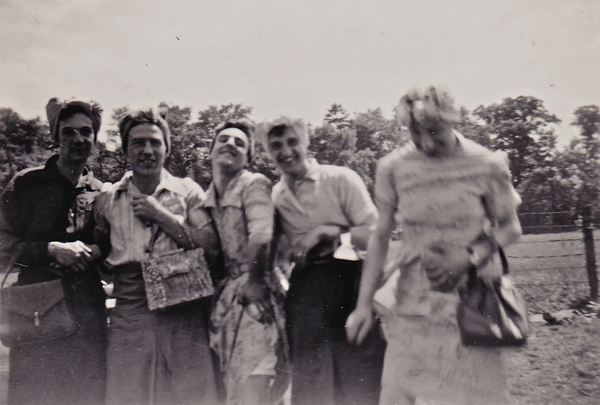 And the exuberant photographs vividly communicate the spirit of carefree Summer jaunts and youthful high jinks that presided, illustrating how St. Hilda’s performed a crucial social function, as Leslie confirmed with a gleam in his eye. 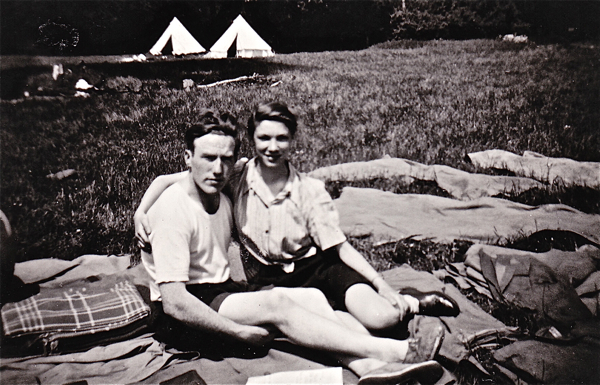 “Twenty marriages came out of those years at the club,” he boasted, “including my own” – glancing quietly to a nearby photograph of Joyce Lucretia Graves who died in 2007, whom Leslie had known since she was seven and whom he married on the 29th March, 1952. “Joyce was determined we should marry in St. Leonards, Shoreditch, but we were out of their parish and the Reverend, a guy by the name of Rutter, wouldn’t permit it.” admitted Leslie. Fortunately a priest that Leslie knew during the war stepped in and performed the ceremony “with bells and everything,” he informed me, triumphantly. And when thick snow made wedding photos impossible outside the church, Leslie and Joyce led the wedding party over to St Hilda’s East where they requisitioned the gymnasium for their pictures. In the fifty years that passed between these ceremonies at St Leonards, Leslie worked as a butcher at Smithfield, maintaining his ties with the area and becoming a Freeman of the City of London – even though he moved from Bethnal Green with Joyce and their two children, Ian and Colin, in 1968 to live among the green fields of Romford. 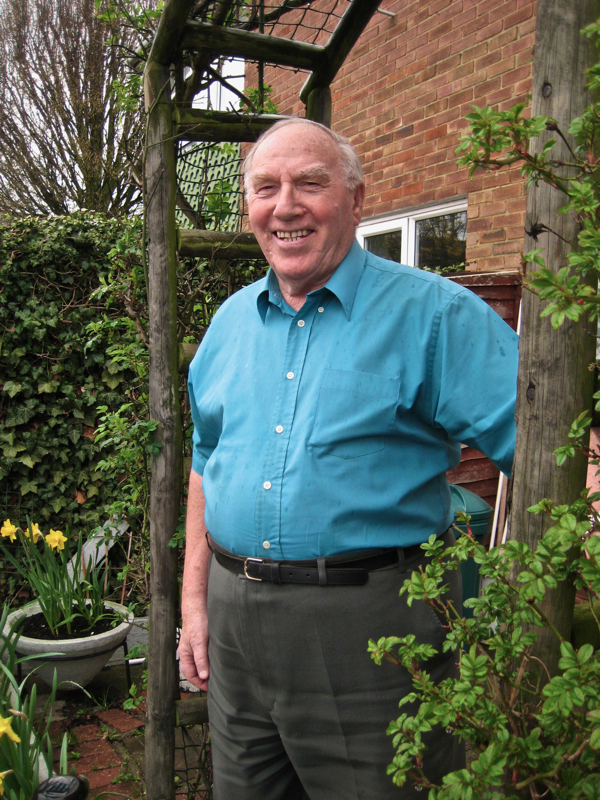 Demonstrating his passionate sense of community, Leslie was President of the St John’s Ambulance, Mile End Division for thirty years, and became Vice President of the South West Essex Burma Star Association, so I was not surprised to learn that he was awarded the O.B.E. for his service to others. “I still sing the school song to myself every night,” Leslie told me, revealing the depth of the connection he feels to Bethnal Green even now, and, quite unselfconsciously, he sang the opening verse, beginning, “Columbia, the name we treasure/ Thy name ever dear to me/ Thy memories will always bring me pleasure/ Through far away I may be…” just as he remembered hearing other soldiers sing it in the tents in the jungle when he was serving in Burma so many years ago. And as I listened, Leslie Norris became “Ginger” Norris again and I understood the indelible impression that the vibrant life of this small patch of streets in Bethnal Green had in shaping his destiny. 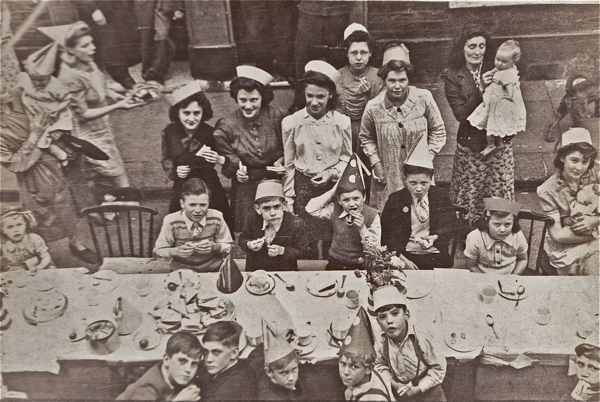 Post-war celebrations in Cuff Place, where Leslie and Joyce lived for the first twenty years of their marriage – Joyce stands at the centre of the lower picture. 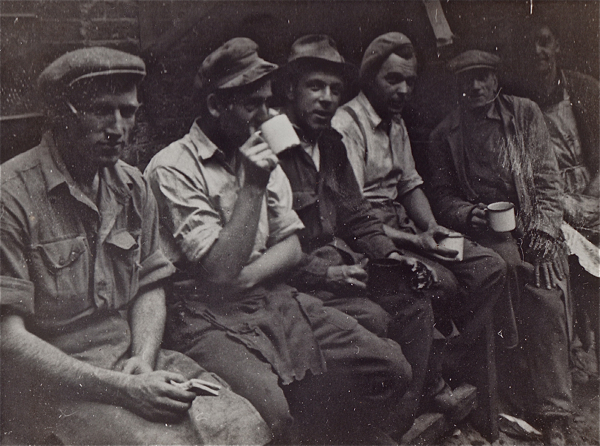 Leslie (on the left) with pals in Bethnal Green. 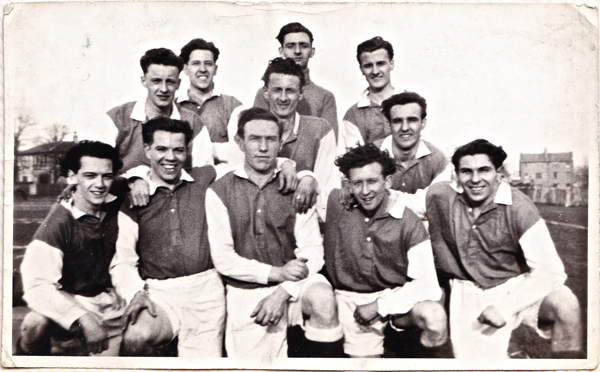 Leslie as captain of the St Hilda’s football team. 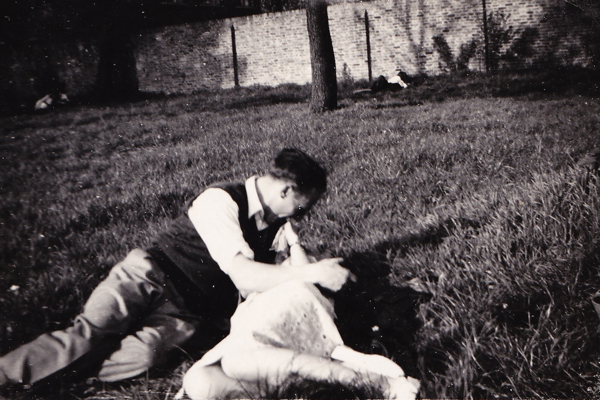 Leslie and Joyce on their first date, Southend, Easter 1949. 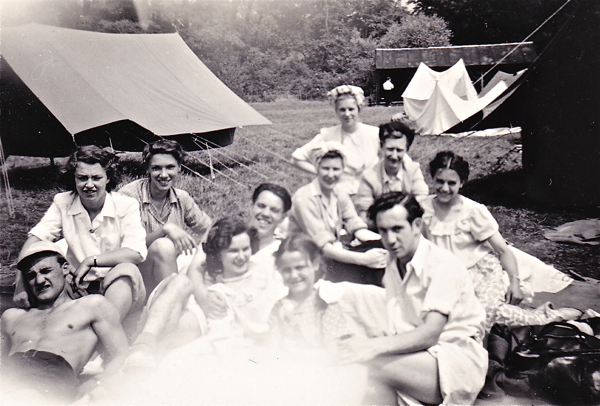 On a Summer camping trip from St Hilda’s East. Leslie and the boys enjoyed getting into drag for a lark. Joyce did the washing up in a field. Leslie swept Joyce off her feet. 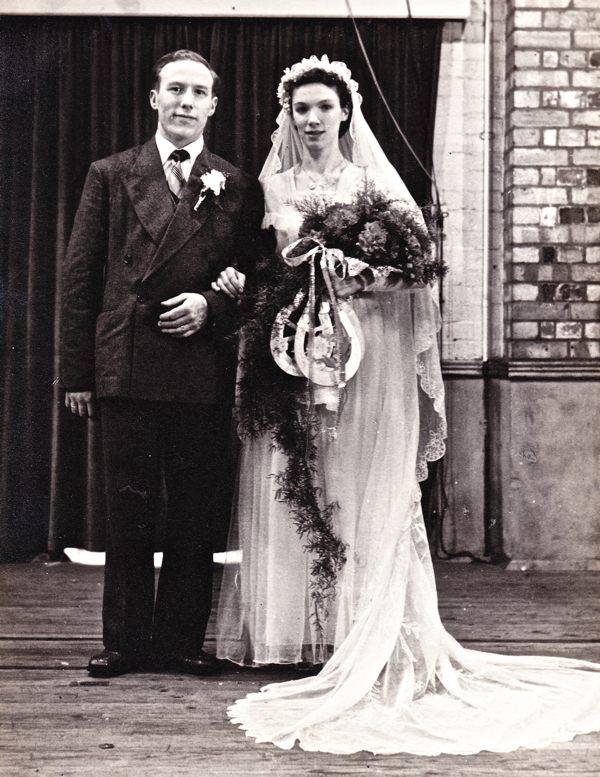 Leslie and Joyce on their wedding day after the marriage at St Leonard’s, Shoreditch, 29th March 1952, – photographed in the gymnasium at St Hilda’s due to heavy snowfall. 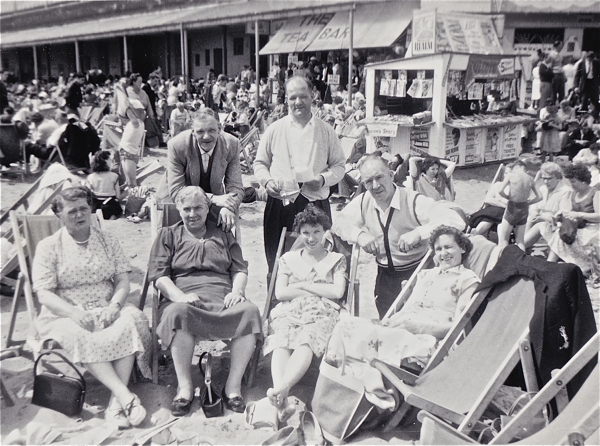 Joyce sits among family on the beach at Ramsgate in the sixties. 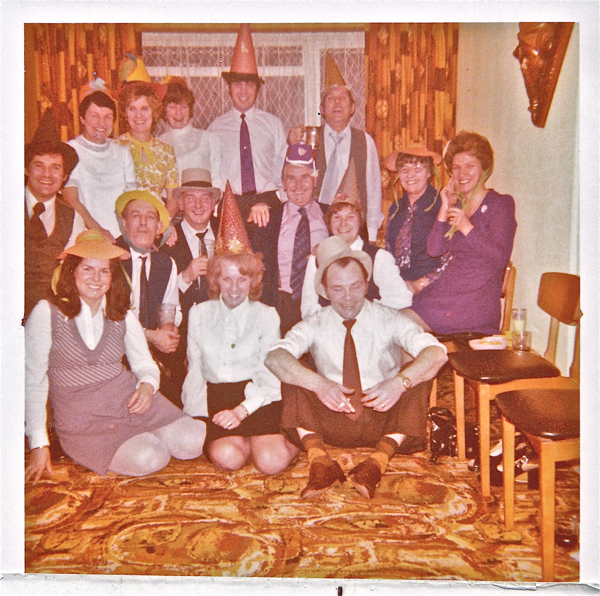 A gathering at Leslie and Joyce’s in Romford in the seventies. 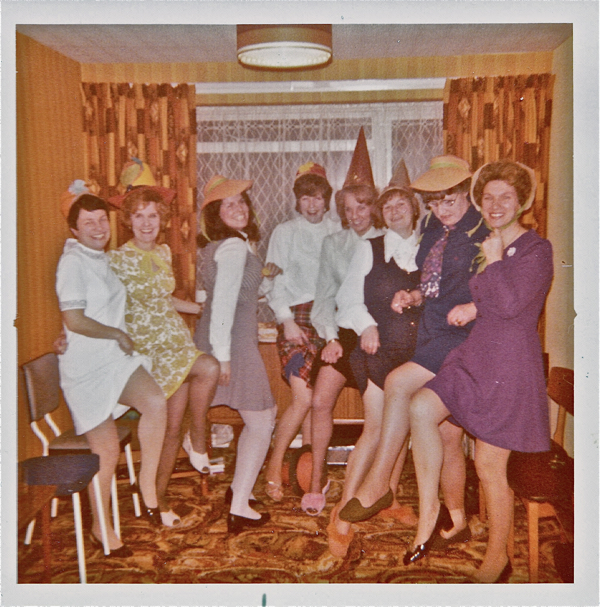 Joyce and friends enjoy a knees up. Leslie Norris of Bethnal Green. though far away i may be…. in the jungles of burma or essex. another wonderful tale. are those horseshoes on beautiful joyce’s bouquet? Some reports upon current activities at St Hilda’s are in preparation…. Wonderful to read about Leslie Norris and his family including brother Joey.I remember the family well, in fact I delivered their newspapers when I lived in Arline Street. 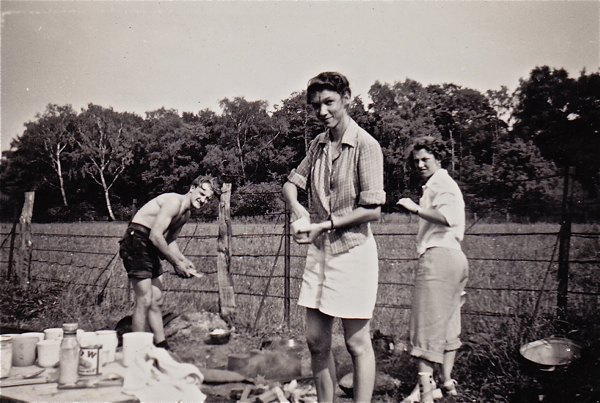 This is so poignant – happy memories, tinged with loss, and those connections with people and place which grow over long years. Just beautiful. Had a bit of a nose around St Leonards in Shoreditch about a month ago. Was locked up, unfortunately. Thought it might be dilapidated, but there were workmen painting gates etc., so something positive was happening. Would have liked to have looked inside. Lovely to read stories about Bethnal Green and especially about your connection to Cuff Place. 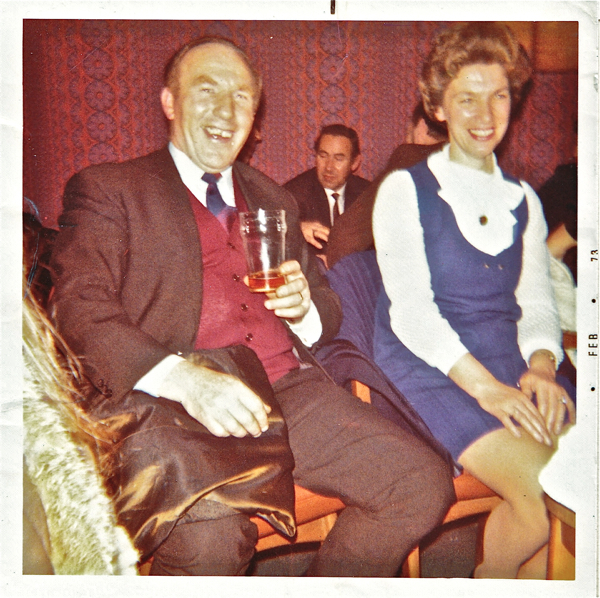 After his divorce from my mother, my father lived at 15 Cuff Place and always used to be proud of his piano playing in pubs. Do you happen to remember him at all? I never saw him after 1952 and at the time of his death – 1977 – he was living in Deptford. Any titbits or tales about him would be most appreciated! Great photos, my ancestor the late John Norris born Hackney 1796 married a Mary Ann Winnood on the 6/1/1822 children Thomas 15 Joseph 15. William 13. and James 9. James Street Mile End Old Town Middlesex 1841 census, John Norris a Mariner, passed away 1840. Mary Ann a dress maker. Would love to connect with ancestors I am from Australia. So sad to announce the passing of my Dear Dad – Les Norris BEM – who passed away peacefully at home at 21:45hrs Wednesday evening (04/09/13) – aged 87. Thanks go to all of the District Nursing Team (Team Two) from Romford Clinic, Family Mosaic carers, St Francis Hospice and the Marie Curie team – all of whom were fantastic. Thanks also to all of our family, Iveta and Dad’s many friends who called and visited to support Dad, Colin and myself over the last few weeks. 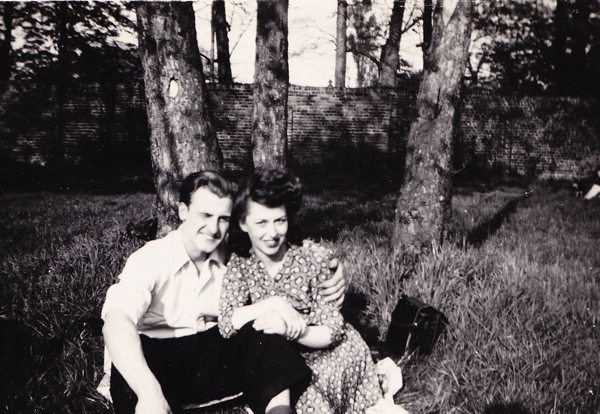 Rest In Peace, Dad – together again with Mum and other family members and friends.